When I listen to California Klezmer music, I also listen for echoes of bluegrass and other American music. In this wonderfully realized first album by long-time Marin-county klezmorim, "the Red-Hot Chachkas," I am rewarded and blessed with just what I wanted to hear: exquisitely-rendered traditional klezmer, with that hint of bluegrass and even, on "Shtetl Swing" and Leon Ahl's Doina, a bit of California jam band and ensemble improvisation. The result is a mechaye, a delight. 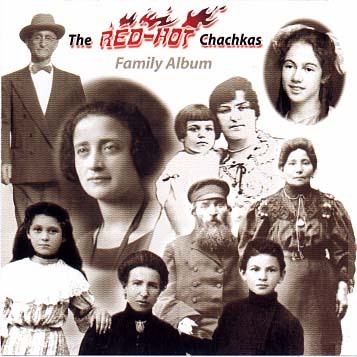 What bands such as the Red-Hot Chachkas illustrate is that klezmer is a living tradition. The ability to record largely from the usual klezmer and Yiddish folk repertoire, and to make the album sound fresh and interesting, is not so common. New compositions by band members Eggers and Phillips are both "of the tradition" and extensions of the tradition. The appearance of "Avinu Malkenu", the haunting Yom Kippur melody that has become part of the entertainment repertoire of bands from Bessarabia to Australia to California also demonstrates how the repertoire of the modern klezmer includes not just the official klezmer dance numbers, but draws from all Jewish traditions, new and old. I have only a couple of production quibbles. First, the rhythm is sometimes too regular and too pronounced. I know that sounds weird, but klezmer, like all good dance music, should flow less like a metronome and more like, well, people! This becomes especially notable in the delicate "Araber tantz," where the freedom for the improvisation comes only with some ability for the band to stay consistent, or on the "Boyberiker Mazeltov Hora," where the original recording's militarily-precise time dominates this new recording, as well. The trick is to let that beat be a bit less prominent (and, to slide a bit, at times), so that the improvisation can soar without having to worry about dancer's feet still finding their way. The other quibble is that it is always nice to have more detail on sources. It is true that anyone who has been to KlezKamp knows "Firn di mechutonim aheym" (accompanying the in-laws home) or "A nakht in gan eydn" (a night in the garden of Eden), but it would be nice to document the source for "Levin hora" or "Leon Ahl's doina" so that those who are inspired by the recordings can also follow backwards. Those are minor points. I hope that people beyond the Red-Hot Chachka's local audience hear this CD. It is the best of all "Family Album"s, one that shows that the family is alive and celebrating together. Pages copyright © 1995—2018 by Ari Davidow. All rights reserved. Last revised 20 October, 2007.